January brought the sun back and dipped the world into flowing gold. 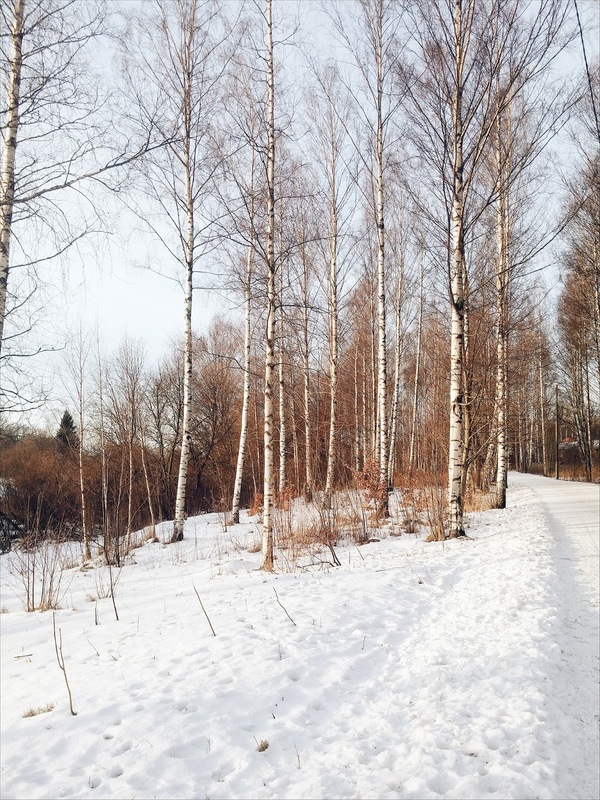 The snow was glittering in the sunshine when I took this photo of the birch trees; one of my favourite kind of trees. Currently, my mind is filled with thoughts. I have to make some decisions, which stresses me out a little, but the sun and the blue sky make it easier to organize my head. The beginning of the year is the perfect time to clear out the life of unnecessary struggles, people, ideas, and items. It is the perfect time to plan the remaining eleven months and to set some goals. And so did I. Yesterday I wrote down a few things I wanna work on this year and some goals I would like to reach. I wrote down those notes on a piece of paper which I hang on my wall to see it every morning and to remind myself of where my paths should lead. I already have an idea of what kind of book I wanna write and I hope I will find some time soon to sketch it in more detail and to make a rough outline of it. Or maybe I will just throw myself into the writing process right away! Well, another quite big thing for me is creating a little EP with my own songs. It shouldn’t be anything big, just a CD with some of my songs for the people who like my music. Maybe I have the chance to record my songs in a friend’s home studio. This is actually one of the points that have been included in every New Year’s Resolution list I have done when I was younger. But I think it is important to keep it in mind every new year. To treat the body right, to stay healthy and to be more conscious of how we live. A healthy life includes a vegan diet, sport and a conscious lifestyle for me. I would like to try out more recipes and get more into baking and cooking again. And now, that I am writing about it, I get really hungry, ah! Already last year, I started to inform myself more and more about a Zero Waste lifestyle. I would love to get more conscious about what I need in life and what I actually don’t, and what I can exchange for a better, less wasting method. I would love to try out recipes for zero waste toothpaste, deodorant or shower gel and find my way into a lifestyle with less trash. There are so many places I would love to see, but somehow I would really love to travel to Iceland this year. This beautiful, little inhabitated country fascinates me so much and I am looking forward to exploring the Icelandic nature. I always have so many projects on my mind that sometimes I am too overwhelmed to start any of those. But two of my projects this year is to improve my knitting skills and my knowledge about herbs. Both topics have been my passions the past year and I finally want to get deeper into it to finally knit my own sweater, socks, and hats, and to plant herbs, and mix my own herb teas. I finally want to finish my study. I hope that I will be done with all my classes and my thesis this Winter and well, then I hopefully have an idea what I wanna do after. I don’t know how my life will look like at the end of this year and what chances it will offer me throughout the year, but I hope I will find my way into the world when I finally finished my study. Like I said before, most of the time I have way too many projects I am working on. Because of that, I haven’t read any books for pleasure for months. I can’t even remember the last book I’ve read in my free time, not for university. And I really want to read more again, read books I like. But I don’t know how much time I will have in the coming months, and sometimes my mind is just too restless to concentrate on words. And the final resolution for this year full of adventures is smiling more and saying Yes to life. Because of different personal reasons, the past two months have been quite dark and now that the sun is showing up again, I want to motivate myself as well to smile again and to take challenges and go on more adventures again. Life is so much more excited with a smiling face! Well, we will see how long I will stick to those resolutions and which goals I have reached by the end of the year. Maybe I quit some, maybe I exchange some for something else. You know I am erratic, my mind is full of ideas, hihi. What are some of your New Year’s Resolutions? I would love to read some of your goals for this new year!